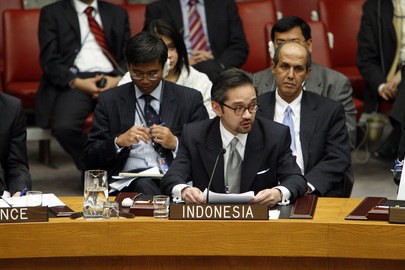 UNITED NATIONS, September 27 -- When the US foreign policy establishment as represented by the Council on Foreign Relations hosts Indonesian foreign minister Marty Natalegawa, what gets asked about? Mostly business rights, leavened or made palatable by a couple of human rights question, from two representatives of the same organization. When Natalegawa replied Tuesday at CFR that Sri Lanka is "trying to do the right thing," there was no response or opportunity for Press questions. CFR's presiding moderator was corporate lawyer James D. Zirin, whose specialty the program listed as "the defense of major accounting firms and financial institutions." So he's defended predatory lenders who took US government bail outs, before asking Natalegawa about his country's economic growth. The money questions were followed up by, among others, Drew Ladner of Pascal Metrics Inc., who began by helpfully disclosing that he is "long" Indonesia. Listed as participants were businesspeople from Citigroup, Goldman Sachs, Blackstone and Corsair Capital. As if to give the filthy lucre a sheen, both Human Rights Watch and Human Rights First were in the house, although only HRW got to question, twice as it happened. In essence this was window dressing to make the profit focus less venal. Natalegawa twice emphasized his country's economy grew six percent in 2010, with 6.5% projected for 2011. If these was a roadshow, CFR was buying. Inner City Press despite being invited, RSVP-ing and arriving on time was not allowed a question, nor a follow up to the Sri Lanka answer. No one asked for example about Saudi Arabia's treatment and execution of Indonesian workers. Thankfully, thirty blocks from CFR's Park Avenue headquarters Inner City Press came upon Natalegawa and his Permanent Representative Monday evening in front of the UN, and asked if Tibor Toth's statement that Indonesia is about to join the Comprehensive Test Ban Treaty is true. Yes, Natalegawa answered, it is in the works. At CFR he spoke of a nuclear free zone, of ASEAN meetings with the nuclear powers. He fielded questions about Western Papua, speaking of groups armed with bows and arrows. Natalegawa described Indonesia's policy at the Human Rights Council in Geneva as in evolution; he chided the proponents of country-specific resolutions for putting forward the same drafts year after year. Natalegawa called this inertia, a term that could equally be applied to today's Council on Foreign Relations. Watch this site.